Hurricanes make a great metaphor for life. How many times has something happened that either threatens to destroy your life or outrightly did it? During Hurricane Irma, an acquaintance wife lost her battle with cancer. During Hurricane Irma, a friend of mine received bad news about his dad. During Hurricane Irma, a friend of mine suffered a significant loss in his ministry. #1 - Accept help. You cannot bounce back on your own. Have someone to talk to. Help someone in need. Don't be alone and don't let your family go through this alone either. #2 - Belief in the plan. God always has His best intentions in mind for you at all times. How you may think, "Well, if God really loved me He wouldn't put me through this." Nope, not true. But God has a plan for you and your life. This is only part of it. He will not let it defeat you. #3 - Accept the new normal. Even for those of us who did well through Hurricane Irma will never forget it. Try to do things that you use to do before the hurricane. Especially if you have kids, it helps them to regain their sense of security. But don't be surprised that in the next thunderstorm if one of your kids has an anxiety attack. It's normal. 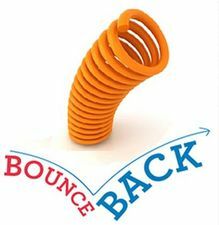 PRAY: Dear Jesus, help me bounce back. PS This Sunday is National Back To Church Sunday and Pirates Day at FFWC. It would be good for you and your family to be back in church.